US $4,575,000	Need Finance? Need Insurance? 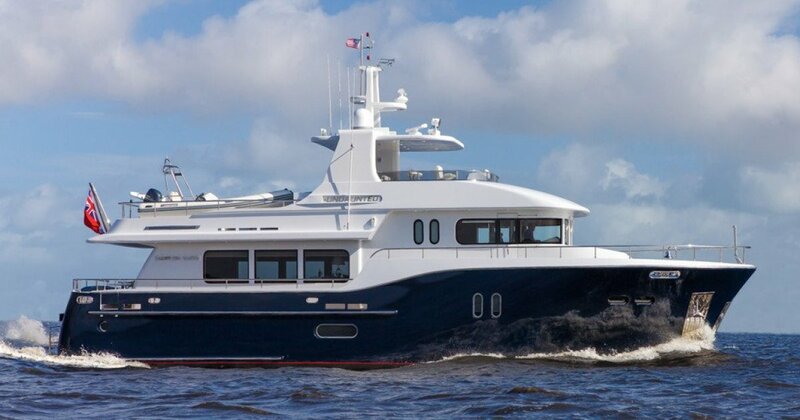 Undaunted is built on the proven fast-displacement hull form designed by acclaimed Naval Architect Jon Overing. 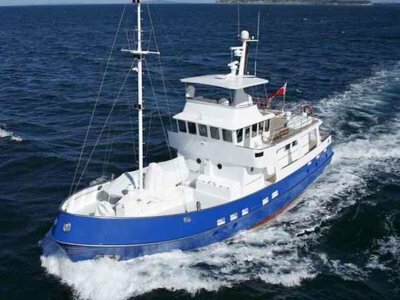 She has excellent sea keeping ability and comfort designed with emphasis to on hull form to reduce pitching and dampen roll. 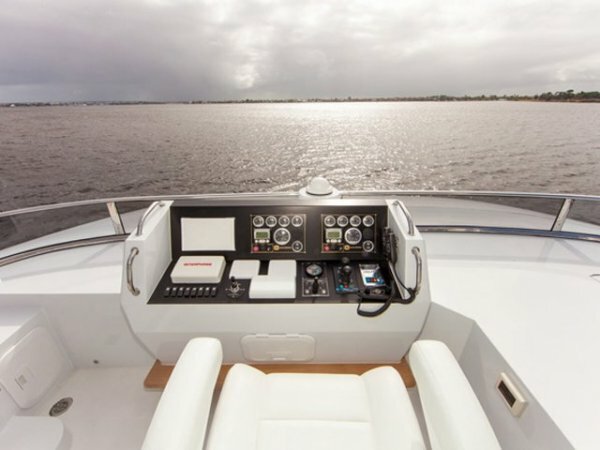 She also has the ability to maintain higher cruising speeds in unfavorable conditions while still providing a very comfortable ride. Additionally there is large interior volume well exceeding that normally found in a vessel of comparable length. 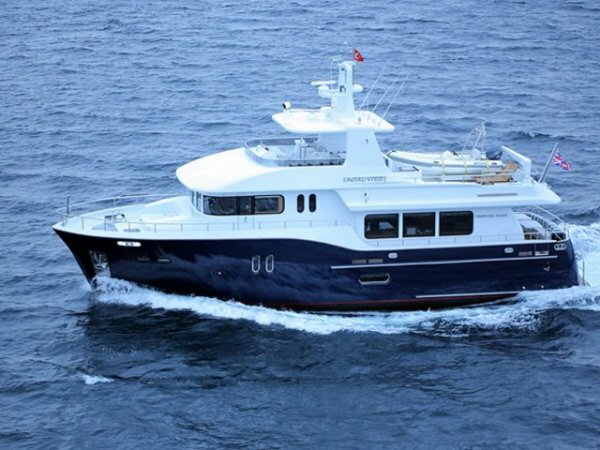 Step onboard Undaunted and enter the Mega Yacht quality interior designed by the renowned JC Espinosa. Relax in the truly stunning salon and enjoy the elegant formal dining that seats eight. The traditional raised panel oak interior is complemented by large windows to create a light and airy atmosphere. 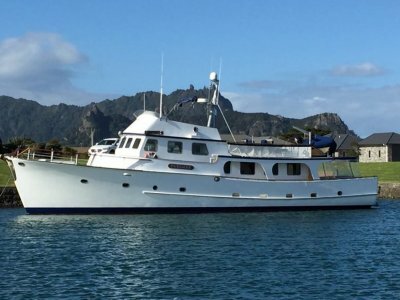 There is an exceptional four stateroom layout with ensuite baths and separate crew quarters, along with separate laundry facilities and provisions department. 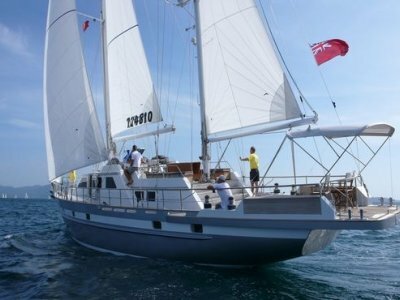 These features greatly enhance the practicality and comfort for long distance cruising, especially when accompanied by a number of guests. 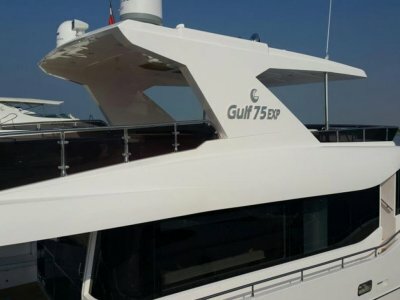 The generous freeboard forward combined with the raised pilothouse configuration results in a tremendous eye-level of 15-feet above the waterline. This gives a commanding view with unobstructed visibility. 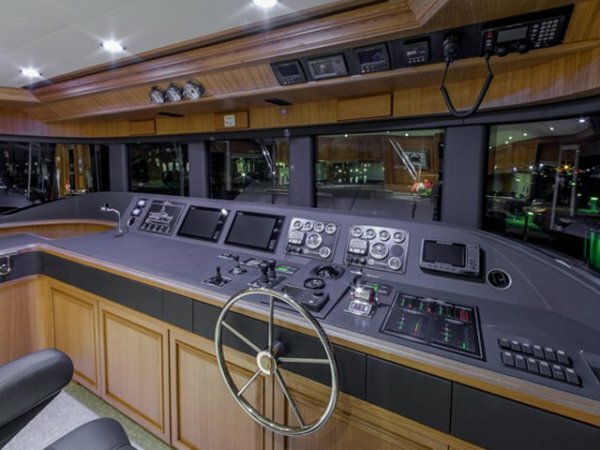 The ergonomically designed helm station includes a vertical window style. 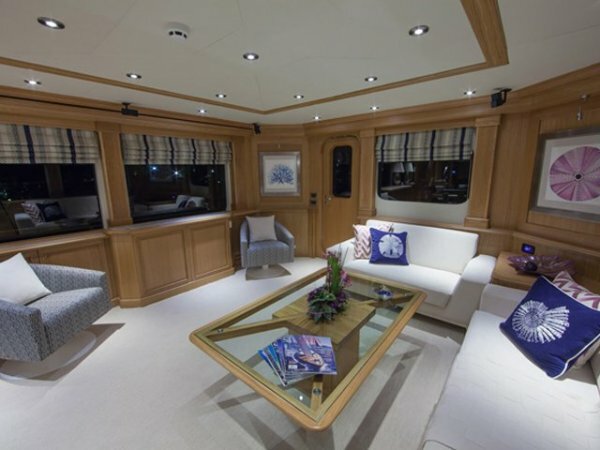 Aft to port is a richly upholstered settee with table doubling as a pilot berth for long voyages. Aft to starboard is the well placed on-deck head. A comfortable stairway to the flybridge makes access easy and convenient for both crew and guests. 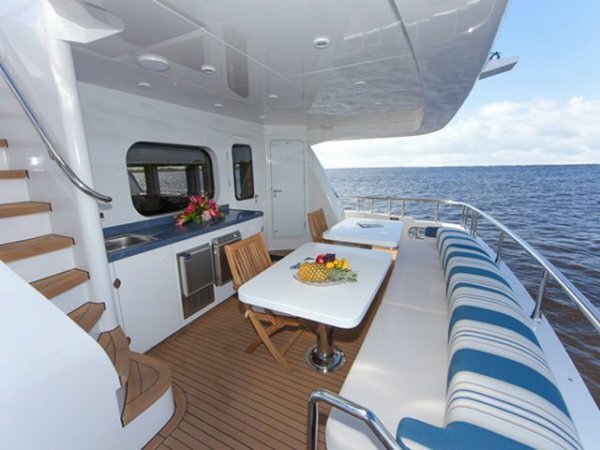 Adjacent the flybridge dining is a fully equipped service bar and stainless gas grill. The bar is ideal for a staging area to serve a formal meal or can serve as a buffet for a la carte. The bar is equipped with a refrigerator, ice maker and stainless sink. There is a full-beam master stateroom accompanied by a full-beam bathroom. 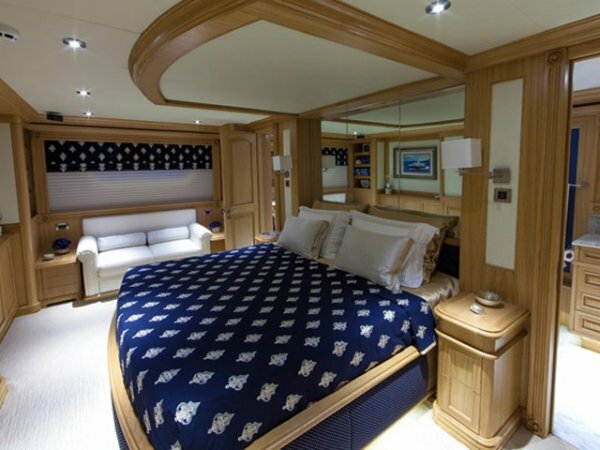 Complementing the king-size bed are built-in dressers to port and couch to starboard. Forward to port is a large, double-door, cedar-lined closet. The his-and-hers bathroom is divided by a large glass and marble shower with separate toilets and marble topped vanities. The lower level laundry facility is located underneath the guest stateroom compartment with six-foot four-inch headroom. Equipped with two washers, two dryers and soaking sink, along with three 5-cubic foot freezers and dry provision storage. The nicely appointed crew quarters have upper and lower berths, ensuite bath and cedar-lined closet. To port is the lazarette featuring a large stainless "country style" sink, built-in cabinetry and large stowage locker. The galley is fully equipped with under mount stainless double sink, wall oven with microwave above, cooktop, dishwasher, trash-compactor and SubZero refrigerator/freezer. 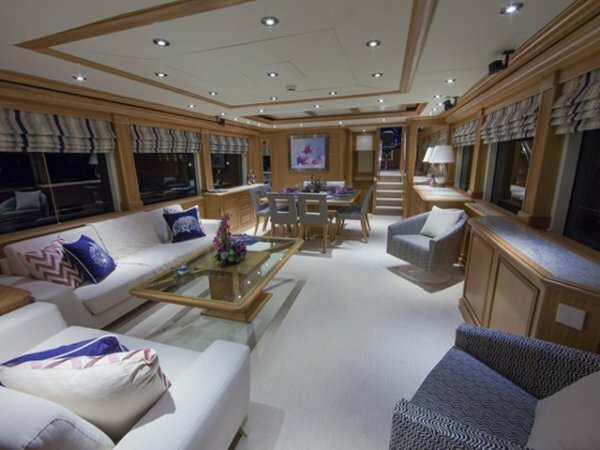 Within arm's reach of the galley is a plush, elevated settee creating a comfortable, flowing space for casual entertaining while underway or at anchor. 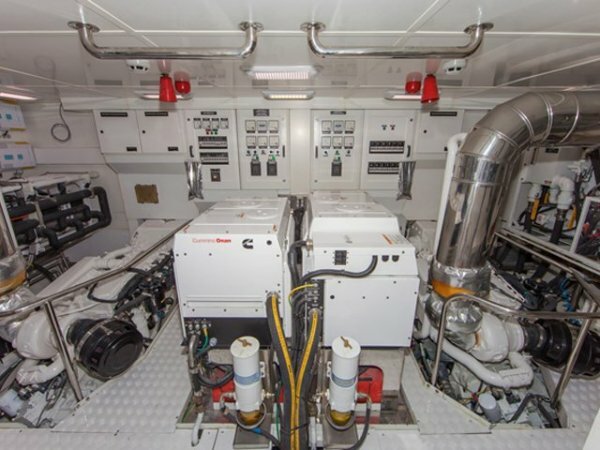 This is ideal for owner operators who do not want to be isolated in the galley. 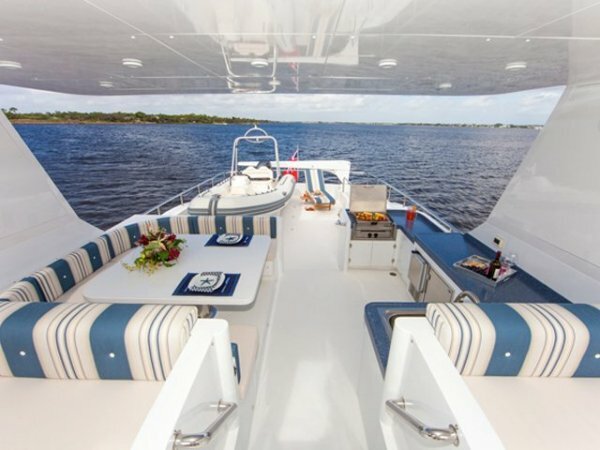 Full walk-around side decks, an inviting foredeck, large covered aft deck with stairways to the platform and boat deck eliminate traffic through the salon There are lounging areas on the foredeck, aft deck and flybridge. Two dining alfresco areas are incorporated on the aft main deck and flybridge that will comfortably seat eight. The flybridge dining table also drops down to form a large lounging pad. The generous deck space to accommodate the 17' tender and the boat deck can also accommodate scooters and other water toys.